The 4098 foot Cascade Mountain is located in the High Peaks Wilderness of the Adirondacks and is one of the Adirondack Forty-Sixers. Of the "46 Adirondack High Peaks", Cascade Mountain is the most accessible, the most frequently climbed and is probably the easiest to hike. Most hikers attempting to join the ADK 46er club start with this mountain. The main trailhead is on NY 73, six miles east of Lake Placid, at Cascade Pass, overlooking Cascade Lake. The summit is visible from the trailhead, a rare occurrence in the High Peaks. 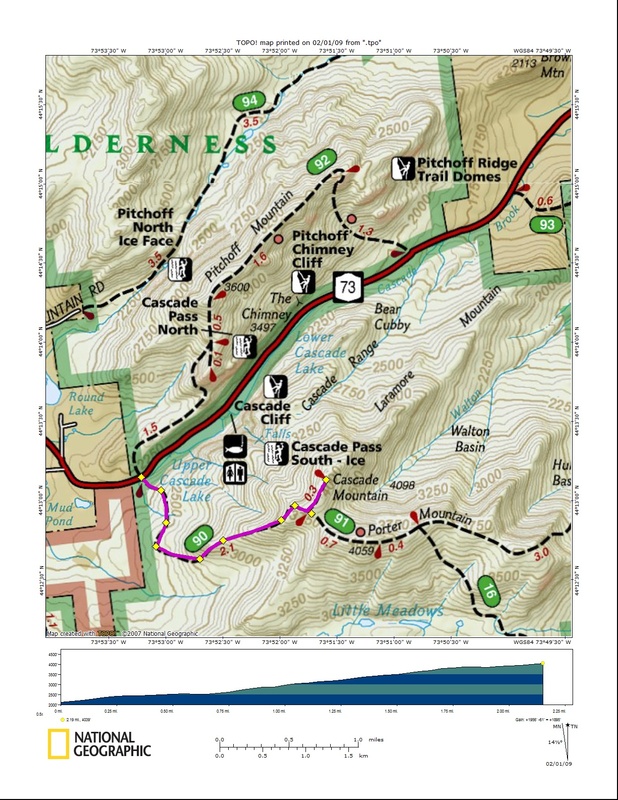 The well-used 2.4 mile trail follows red plastic markers and has an elevation gain of 1940 feet. Cascade Mountain's bare rock summit is the result of a fire. There are 360 degree views on the summit and on a clear day with good weather you'll often find many other hikers on the summit. The 4059 foot summit of Porter Mountain is an easy side trip and is one of the Adirondack Forty-Sixers. Most attempting to join the ADK 46er club usually do both Cascade & Porter on the same hiking trip. Two down and 44 to go. The trail itself is very easy to follow and very well marked. The grades are moderate throughout and the woods and surroundings make this hike an enjoyable woods walk. The climb is steady but not uncomfortable. After climbing steadily for 1.8 miles you achieve your first view at an open ledge with Algonquin, Colden and Marcy appearing in front of you. This is a great spot to catch a breather and get ready for the push to the summit. The trail then heads back into the woods but the summit is rather close. The intersection with the Porter Mountain trail appears with a sign saying the Cascade Mountain summit is 0.3 miles away. Just past this intersection, the trail opens up and the bald, rocky summit dome of Cascade Mountain appears. From here you are hiking on bare rock, will be very exposed to the elements and will enjoy 360 degree views. Look below for a video and map of this popular hike in the Adirondacks.